From Taya Kyle, New York Times bestselling author of American Wife and widow of “American Sniper” Chris Kyle, an inspiring collection of stories, both personal and drawn from American history, that showcase the resilience of the “American spirit.”After losing her husband, “American Sniper” Chris Kyle, Taya Kyle entered a period of immense pain and grief. She was able to pull herself from the depths of that devastation with the help of family and friends—and also many strangers across America, who shared their own stories of suffering, survival and triumph. Bolstered by their resilience, Taya began a new career as an inspirational speaker and foundation leader, spreading her message of hope and love across the country.Now, in American Spirit, Taya gives back to those who helped her along the way, by sharing the stories of Americans who inspired her. 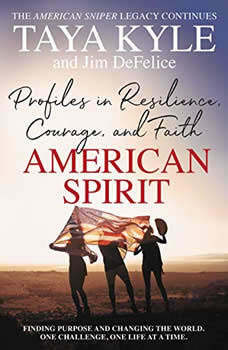 Working again with trusted collaborator Jim DeFelice (coauthor of American Sniper and American Wife), she tells the remarkable stories of more than 30 Americans, young and old, rich and not-so-rich, famous and unknown, who have done extraordinary things for their communities and for the national at large. There is the 9/11 survivor who became a senator, the reality TV star who helped the homeless when everyone else wanted to send them out of town, the young man who went trick or treating for a local food bank—and many other veterans, ministers, reporters, football stars, pilots, and teachers who show the very best side of America.